A lot of performers have put on a suit, stepped up to the mic and made an attempt at the gold standards. It’s an alluring cannon of music which instantly resonates with a huge number of music fans. The problem, though, when you sing classic songs is that it’s nearly impossible for people not to compare you and your performance to the great performers who originated them. Michael Bublé seems acutely aware of this fact and the range of his voice, and he uses the music and style of Sinatra, Nat King Cole and even more contemporary artists as a jumping off point for his own unique sound and style. While Bublé has a very strong voice he doesn’t have the same lower register / golden throat that gave Sinatra’s music those well-rounded, sweet lower tones. Bublé seems to acknowledge this and intelligently navigates his way thought the best-fitting Sinatra songs for his register, including “I’ve Got The World On A String” and “All of Me” which feature big high notes that Bublé can hit with ease. While Bublé may not have the same vocal depth of someone like Frank Sinatra, he does have an extraordinary talent for showmanship. It would be easy for a good looking, well-dressed crooner to have an ego to match, but Bublé remains humble and emotionally honest on stage. At one point in the show Michael Bublé stopped to address the men who had been dragged by their significant others to the concert, musing that they must be thinking, “Oh my God, he’s so gay!” (and then following it up with talk of his engagement to Argentinean actress Luisana Loreley Lopilato de la Torre). Bublé often poked fun at himself and at one point during the show quipped, “I’m just doing what you do in the shower – they’re just paying me to do it.” Bublé is simply charming and the sold-out crowd at the Rose Garden (on April 2nd, in Portland, Oregon) acknowledged it with every step. Thirty and 40-something year old women screamed and swooned – albeit in a lower key – like teenage girls screaming at a Jonas Brother’s concert. The truth is, you don’t have to be a Michael Bublé fan to love his concert. It’s not a pre-requisite. Bublé puts on such a fantastic and intimate show that he’s sure to win over even the guys who get dragged along to see him. “Concerts are boring!”, exclaimed Bublé during one of many interlude talks with the audience. “If you just wanted to hear my music you could stay home and listen to the CD. This is your show and you should have fun”. Sliding across the slanted marble stage, Bublé always looked like he was having a good time. He has an infectious energy that lights up whatever he sings. One of my favorite moments in the show was when Bublé sat at the piano and sang the song “Best of Me“, originally done by David Foster and Olivia Newton-John. Bublé spoke about going through a tough point in his life and how the song really resonated with him during that time. I don’t think I’ve seen a more emotionally honest performance in my life. Bublé made every word of the song sound like it emanated from a deep place within, and at the end of it, when the lights went down, he wiped his eyes. This touching moment was followed up by one of the most odd and funny moments of the show. As Bublé got up, the band started to play Steve Wonder’s “For Once in My Life”. Bublé shot a look at his musical director and partner Alan Chang and then started to work his way through the song. About a minute into it he asked the orchestra to stop and then broke into laughter. “You see, on my copy of the set list, the next song is ‘Georgia on My Mind’ “. It was a very real moment that fit well with this very alive concert. After switching over to “Georgia on My Mind”, Bublé and company gave another shot at “For Once in My Life” which had an air of spunkiness and humor that was quite fun. 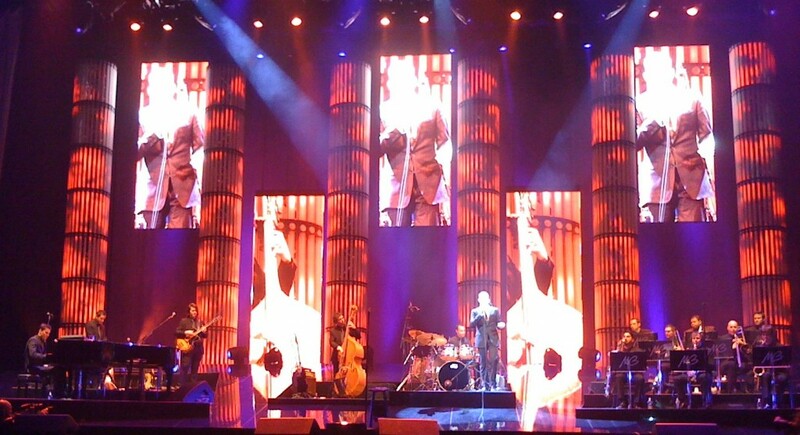 One of the things I really appreciated about Michael Bublé’s show was his treatment of his own original hits. None of them felt tired or overplayed and he brought as much enthusiasm to “Haven’t Met You Yet” as he did to some of the classics he sang. Bublé closed the show with what seems to be his signature closing song, “A Song For You,” made popular by Donny Hathaway. The final refrain of the song Bublé performed in front of the closed curtain without a mic. It was a very nice nod to the classic performers who didn’t always perform with amplification, and it showed that while he may not have Sinatra’s golden throat, that boy can sing. Concert Running Time 1 hour and 40 mins with encore. of Michael Buble. I have seen him in concert twice and was blown away each time. Michael has that down to earth quality that endears him to his audience, that quality along with a huge talent has raised him to super star status…………….Long may he reign. Michael is the only singer to come along that has intrigued me as much as Sinatra. I completely agree he has what it takes to be a star. It will be very interested to see him continue to grow in popularity and as a performer. I can totally see that. He also seems smart enough to establish himself individually rather than just trying to be a heir apparent to Sinatra. My wife and I drove from Lewiston, Idaho to watch him in the Rose Garden for the second time. Awesome. What a great venue for concerts. Michael did another outstanding show, interactive, funny, brilliant lights and video. The center stage on the Rose Garden puts the folks way in the back in the front row. I would like to see a version of the acoustic guitar and Michael singing Home re-released. This young guy has known what he wanted to do since he was 12 or 13 and it shows. I went to Seattle Saturday and it seemed almost better. Sounded better. Looked better. Felt better and I was more into it. Having been in broadcasting for 26 years I guess it kind of took me off guard to see all the video and light coordination and how it all comes together. Really an enjoyable show. If you have not taken your wife to a show, go and take her, both of you will love it. If it's a girl friend or boy friend, go to the show. I would even go alone and have fun. Only gripe is paying $12 for a shot of Scotch in Portland…….it was good Scotch though. And $9 for Pyramid Hefevisen! What a wonderful concert. My husband and I had received tickets from our children for a Christmas present and a big "Thank You" to our kids. We too, drove from the Lewiston-Clarkston area to attend this concert. It was our first, and won't be the last. Being a Music teacher, I've followed Michael's career since the first interivew I saw years ago. I was beginning to wonder if I would ever get to see him in person. There is absolutely no one who can interpret a song like Michael with such emotion and tenderness as on "Best of Me", "Home," or "Song for You." What and energetic and hard working entertainer who shows his appreciation to his fans, band, crew and mostly his family. Great Show!